Seth MacFarlane is known for pushing the limits. He practically takes over FOX every Sunday night with various animation programs that would make your parents cup their own ears. He’s also shown his naughty side with his feature film debut hit Ted, a crass comedy about a friend and his talking – occasionally drunk and high – teddy bear. With his latest anticipated endeavour A Million Way to Die in the West, those gross-out gags are still in tact. One of the funny running jokes centres around a Christian couple who hold out sexually for each other while the girlfriend goes off and earns money at the local whorehouse. The husband is hunky-dory with this and even awaits her return every evening with a bouquet of flowers. Coarse language is thrown around, but not in a way where that’s the only apparent joke in a scene. When a period film solely depends on its out-of-place salty swears, you get a one-note flick like the disastrous stoner bomb Your Highness. With MacFarlane’s western, it’s to further back up the lead’s neuroses about the terrible, deathly living conditions around him. Random bull attacks at the fair will do that to someone. But while some of these shock jokes are funny, most of them seem to be here out of obligation. Because MacFarlane has made a name for himself using cynicism and unadulterated content, its as if the film is contractually tied to putting in low blows for the sake of filthiness – those visual gags dealing with bodily fluids are a good example. What shines brighter for me are the steps the filmmaker has taken to set a sweet romantic comedy in the wild, wild west. It’s what makes A Million Ways to Die in the West a hilarious winner, and a charming one at that. Seth MacFarlane plays the male lead, and we never see him as anyone but Seth MacFarlane. However, he encompasses the role of sheep farmer Albert Stark just as Woody Allen would play a character. Sure, he’s playing someone with a different attitude and name, but the thoughts that are blurted out from our unlikely hero aren’t very far from the star’s real opinions and sense of humour. 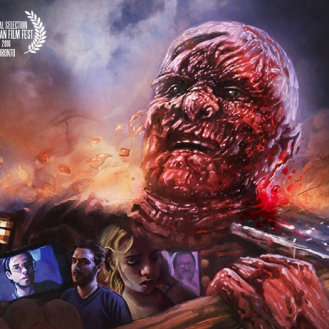 As an actor, that’s one of the benefits for McFarlane when he’s also co-written the screenplay. It’s hard to see everyone else in the movie as a character because they’re so recognizable. But, their over exaggerated western stereotypes are a lot of fun. It’s easy to see everyone is having a blast on screen, and they want to invite us along for the ride. A keyword other than “hilarious” that McFarlane’s film has a relation to is “theatrical”. As people may know, MacFarlane has a strong liking towards lavish stage productions. 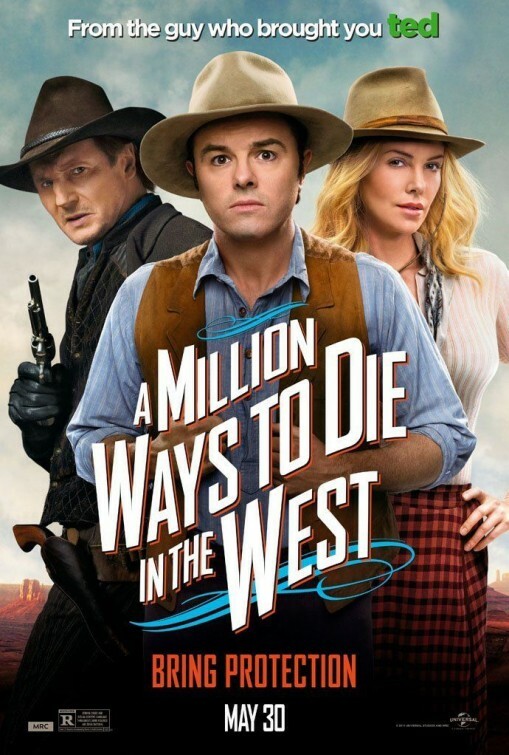 A Million Ways to Die in the West has that quality to it. The sets don’t feel as flat as that statement may make them sound, but its showy presentation with rich cinematography of the western plains along with its sweeping score makes it perfectly clear that MacFarlane is wanting to replicate a large stage production for the big screen. He doesn’t make the execution cheap and he manages to squeeze in a great musical number as well. As a filmmaker, MacFarlane is still working on making tonal shifts seamless. He’s come a long way since Ted, which felt like the director trying to cover too many emotional bases at the snap of his fingers. Here, he has his enjoyment creating eccentric comedy during the romantic bits between him and Charlize Theron. The two have solid chemistry during the amusing dialogue. Then, the film switches to something more suspenseful with Albert on the run from the ruthless Clinch Leatherwood (played by Liam Neeson). Both of these moods work, but its the transition that suffers a bit of turbulence. A Million Ways to Die in the West is a hoot and a howl. Its absurdity and satire towards religion and life in the wild west is akin to Monty Python material, while the likeable and quirky romance fits in the mould of Annie Hall with cowboy boots.